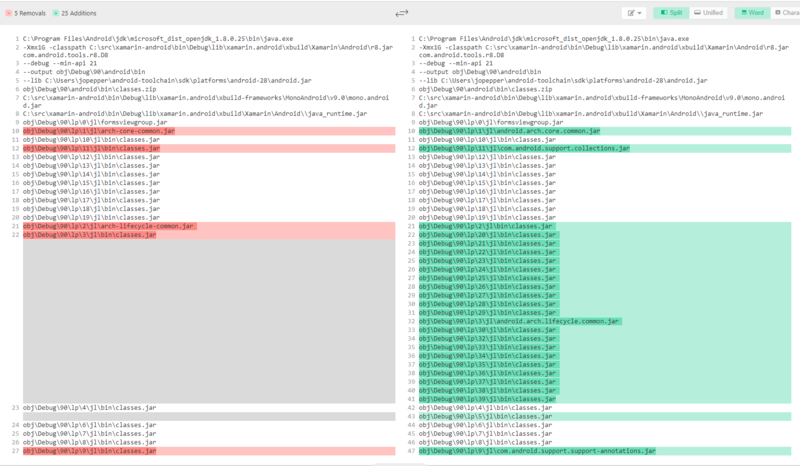 In comparison, the notable difference I see (when using d8): _CompileDex goes from ~15.2s to ~18.2 seconds. The bulk of the build time here is javac + dexing. There are 20 more jar files!!! New project templates in 2019 have comparable build times to 2017. It's OK to be a little slower when adding a few libraries. For some reason the default template has 20 more jar files? I feel like there is something to investigate here. `_CompileDex` step alone goes from ~15.2s to ~18.2s. dependencies of Xamarin.Forms for a long time. ~1,137 methods removed, which should help with the dex limit. ~700KB smaller APK, due to less .NET assemblies & dex code. Looks like it saved over a second of build time for this project. Seems like an "easy win", let's do this!